Anthracnose has many host trees but is very common on Sycamore which is its primary host of A. veneta, while oak is attacked by A. quercina. Ash hosts Gleosporium aridum. It is found throughout the Continental United States and southern Canada. Warm, rainy or foggy late winter and early spring weather, overhead irrigation; dead branches and twigs in crown; masses of infected leaves overwintering on ground all contribute to the disease. 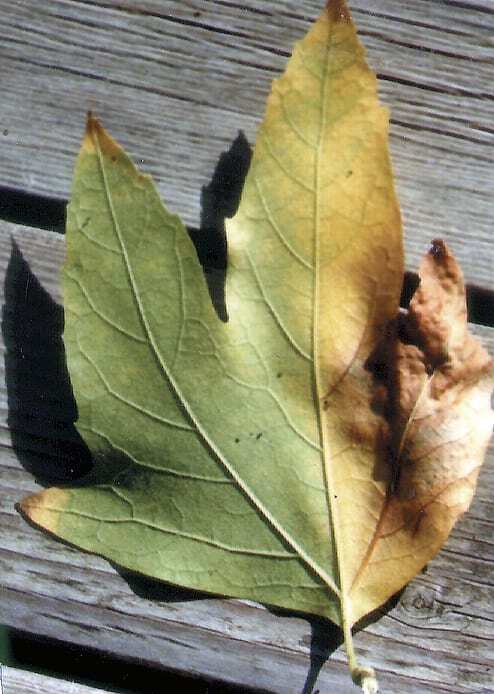 Anthracnose is often considered to be a transition between leaf and stem disease. Spring buds do not mature because the tissue has been killed. During shoot elongation, infection causes wilting and death of growing shoots and immature leaves. The pathogen then moves into vein tissues of mature leaves, resulting in progressive necrosis along the mid-rib and veins; finally, it moves down the petiole into twig tissues where cankers develop on twigs or branches. The cankers are small sunken dead areas which usually occur at leaf scars and occasionally girdle the branch. Heavy infections cause defoliation by late spring or early summer. Repeated annual infections may be fatal to the tree, especially on ash.